In 2012 alone, the Commission on Human Rights of the Philippines (CHRP) reported 43 cases of EJK involving 48 victims; 14 cases of Enforced Disappearance involving 17 victims; and, 39 cases of Torture involving 63 victims. There were 65 documented cases of arrest and detention by the Task Force Detainees of the Philippines involving 133 individuals. The spate of arrests came after the Department of Interior and Local Government (DILG) and Department of National Defense (DND) announced its Php467 million bounty for some undisclosed list of 235 communist leaders. This list would definitely be used to harass political activists and leaders of peoples’ organizations with or without legal charges and would constitute another institutionalized utter disregard of the right to due process. In an October 2012 interview with Radio New Zealand, President Aquino brushed aside criticism of his human rights records as simply “leftist propaganda”. He issued Administrative Order (AO) 35 in November “creating the inter-agency committee on extra-legal killings, enforced disappearances, torture and other grave violations of the right to life, liberty and security of persons”. He promoted military officers charged with cases of human rights violations. Brig. Gen Eduardo Añowas appointed chief of the Intelligence Service of the Armed Forces of the Philippines (ISAFP). He was among those charged in the abduction and disappearance of Jonas Burgos. Brig. Gen. Aurelio Baladad was appointed Deputy Chief of Staff for Operations and before him Lt. Gen. Jorge Segovia who was assigned to head the Eastern Mindanao Command. Baladad and Segovia were among those charged in the illegal arrest and torture of the Morong 43. 2012 also witnessed positive developments in policy reforms. The President signed into law Responsible Parenthood and Reproductive Health Act of 2012, which is restrained for implementation by the Supreme Court following petitions of unconstitutionality by the Catholic Church; the Compensation for Martial Law Victims Act, early 2013, providing compensation, recognition and acceptance of the historical facts of grave human rights violation during Martial Law; the Muslim Mindanao Autonomy Act 288 or the ARMM Human Rights Commission Charter of 2012, an independent regional national human rights institution vested with the powers and mandate of the national Commission on Human Rights within the autonomous region; Republic Act (RA) 101361 or the Kasambahay Law in January 2013, an act instituting polices for the protection and welfare of domestic helpers; the Anti-Enforced or Involuntary Disappearance Act of 2012, an act defining and penalizing enforced or involuntary disappearance; and the Ratification of the Rome Statute. However, until today, President Aquino has never finalized and signed the National Human Rights Action Plan (NHRAP), highlight during the 1stand 2nd Philippine Universal Periodic Review Process (UPR) in 2008 and 2012; a framework that would guide Government’s compliance with its international human rights obligations. It has failed to ensure greater transparency through a general right of access to official information – a Freedom of Information (FOI) law. The right to information is not only on the accessibility of police blotters and military camp records but also of transparency of business plans and records containing also financial reports affecting people, their sources of subsistence and the environment, particularly in areas of extractive industries. The CHRP has neither called to task the Aquino administration on the NHRAP nor determinedly consolidated its reach on the necessity of the FOI as a right and an indispensable component in the fight against corruption through its regional offices, seminars, trainings, lectures, talks and information dissemination. Though there is a noted decline in terms of statistics, very few have been made to pay for what they have wrongly done. According to the Philippine Alliance of Human Rights Advocates (PAHRA), “government and the security sector have miserably failed to diligently investigate and appropriately prosecute the past and present violations. The culture of impunity persists.” This culture of impunity in the realm of civil and political rights is rooted in the impunity of economic, social and cultural rights. Most of the reported cases arise from situations of struggle against mining operations, destruction of environment, demolitions of urban poor communities, land and work, and corruption in the bureaucracy. Lately, violations are directed at human rights defenders. Two more years are left before the present members of the Commission would have ended their terms. Human Rights Defenders (HRDs) in civil society were very concerned as to the perceived divided leadership and lackluster performance of the Commission. After the presidential elections in 2010, expectations of the CHRP were raised when a Human Rights Defender who struggled against repression during the martial law years and had later became a parliamentarian was chosen by the Chief Executive to become Chairperson. As was and is done with various bodies and/or agencies of duty-bearers, HRDs sought a dialog with the CHRP to mutually assess performance, determine accountability and pinpoint areas of possible cooperation. The requested dialog last November 14, 2012 was regrettably not granted. The CSOs nonetheless pushed through with the assessment of the CHRP without the latter’s presence. Twenty-four (24) national organizations participated in the Reflective Assessment. Much of the results of the said assessment have been incorporated in this report. Pursuant to Section 17, Article XIII of the 1987 Philippine Constitution, former President Corazon Aquino on 5 May 1987 issued Executive Order (EO) 163 declaring the creation of the Commission on Human Rights Philippines (CHRP). It is vested with the powers and functions to investigate complaints of violation against civil and political rights, provide assistance and legal measures to victims, monitor State compliance with international treaty obligations on human rights, establish programs towards the promotion and protection of human rights, and the like. The 1987 Philippine Constitution minimally defined the composition and qualification of the Commission. It shall be composed of a Chairperson and four members; natural-born citizens; at least thirty-five years old, not have been candidates for any elective position immediately preceding appointment; and the majority shall be members of the Philippine Bar. The Commission is appointed by the President on fulltime basis and shall not engage in any profession or business that may affect its office. It shall have a seven-year term without re-appointment. Most members of the Commission were appointed in 2008 during the administration of former President Gloria Macapagal-Arroyo except for the current Chairperson Loretta Ann Rosales, who took office in 2010 due to vacancy. Her predecessor was appointed the Secretary of the Department of Justice (DOJ). Rosales’ appointment to the Commission shall be only for the unexpired term of her predecessor. There is no defined and instituted procedure regarding selection and appointment process of the Commission. Neither is there legal provisions ensuring human rights background of candidates, gender equality, civil society participation and transparency in the whole process. Various recommendations were forwarded in aid of instituting a credible selection and appointment process. Human rights and civil society organizations (CSOs) recommended a mixed panel or committee of decision-makers, open applications and consultations with stakeholders as required by international standards. This would make the process focused on front-runner candidates’ credentials, stance on issues and human rights advocacies. “In fact, with this process, critics of candidates will have to make their negative statements in public, with some proof, instead of unsubstantiated comments to the press,” according to CHR Commissioner Cecilia R.V. Quisumbing. Unheeding the call from multi-stakeholders, the appointment boiled down to political connections and compromise with the President. Had the Congress enacted the proposed Charter of the Commission in 2009, independence and pluralism should have been instituted. In Section 12 of the proposal, “the nomination, selection and appointment process shall be transparent and shall ensure broad-based consultation with stakeholders.” CSOs may submit their nominees to the President. Despite having no Charter in 2012, the Commission “has taken further steps to fine tune its procedures in the investigation and monitoring of human rights violations and abuses. It revised, updated and published the CHR’s Omnibus Rules of Procedures and the Manual on Investigation and Case Management Process; Draft Handbook for CHR Lawyers and Investigators on International Humanitarian Law; and a Protocol on Case Management of Children who are Abused, Exploited and Neglected.” Currently, it has renewed attempt to re-file the Commission’s proposed Charter in Congress. This bill hopes to strengthen the Commission’s independence, elaborate its powers and reinforce a functional and organizational structures. Leadership is crucial in ensuring a unified command in understanding and implementing organizational vision, mission and mandate. CHRP’s leadership is contingent on the dynamics of its Commissioners functioning as a collegial body on matters pertaining to the institution. It has a big role in developing attitudes of the staff and officers. It is alarming that the Commission’s leadership body is perceived as divided. Policy decisions and actions seem to be devoid of consensus of the Commission en banc (‘in full bench’/as a whole). Although noted that such problem is the cumulative effect of years of institutional weaknesses, it is not a reason for each Commissioner to work and decide alone or in faction. This division among the Commissioners is noticeable today more than before and highlighted by differing loyalties of officers and staff under the Focal-Commissioner System. The lack of unified leadership of the Commission also reflects in the quality of performance of their regional offices and directors. Because there is no institutionalization of leadership functions, regional offices highly depend on the capacity and character and commitment of its regional heads. There is no clear mechanism to exact accountability of the regional directors and, to some extent, this is also true of Commissioners at the national level. This gap should be addressed in its new Charter. The division within the Commission poses a hindrance in guaranteeing pluralism vital to the establishment of effective cooperation among other sectors of government and society. Accordingly, “pluralism and diversity are important: they enhance an institution’s independence, credibility and effectiveness; they increase the likelihood of cooperation and collaboration with other stakeholders, and they demonstrate that the institution itself takes equality seriously.” Based on CSOs assessment and result of the Capacity Assessment of the CHRP, the current leadership does not command unity amongst themselves and within the rank and file; fails to unite all in one common direction and action. It is doubtful, for instance whether the Roadmap presented by the Chairperson to the public on 10 December 2010 was a collective effort of the Commission. Whereas before, CSOs were informed of a unified stance of the Commission regarding issues and concerns, today, they are at a loss as to whether such engagement and collaboration is based on Commission approved policies or guidelines or just on an individual’s (Commissioner/Officer) opinion. CHRP-CSO relations were made possible through personal contacts. Thus, current engagements and project collaborations are mainly categorized on personal-relational aspects, which are insufficient to evaluate the impact of CHRP’s actions on violations on the ground. Reports would also point that the President looks at CHR as another government agency serving at the pleasure of the Executive; and assumes that the Commission take the lead in defending the administration’s inaction on human rights. These perceptions endanger the independence of the Commission. The Commission is mandated to monitor government compliance to international human rights obligations and asserts its identity in fulfilling its protection and promotion mandates. It is there to welcome government’s positive actions for human rights, criticize and advise it for its failure to do so. It is not an implementing arm of the government but rather guides it to perform its functions according to international human rights standards. CHRP seems to confuse itself and needs to clarify its mandate and delineate its functions from that of the Presidential Human Rights Committee (PHRC). The Commission acts more of an alter ego of the government. Its pronouncements and media releases are more in defense of the current administration’s human rights record, rather than setting guidelines on a rights-based approach. Many NGOs tend to think of this condition as patronage which brings back the unresolved issue on appointment, criteria and selection process of commissioners. The non-establishment of a selection process makes the Commission’s independence even more vulnerable and susceptible to control especially with an attached issue of budget appropriation. “The truest test of independence is found in the actions of the institution: an institution should have the ability to conduct its day-to-day affairs independently from any outside influence. This means that the institution has the authority to draft its own rules of procedure, which cannot be modified, by an external authority. An institution’s recommendations, reports or decisions should not be subject to an external authority’s approval or require their prior review.” Rules of procedures must not remain on paper, it must be observed. The CHRP has an Omnibus Rule of Procedure. It has a Quick Response Team or program, which attends to emergencies even during holidays, weekends and beyond office hours. However, it falls short by shunning requests falling under these circumstances. It reproaches victims rather than assist them in filing grievances; sometimes lacks propriety in the conduct of its investigation and inquiry by availing assistance from groups or company or security command under question. Investigation of cases whether civil or political or economic, social or cultural in nature maybe taken motu propio by the Commission or upon validation of complaint by victim/s, his/her relatives/community, non-government organization, or any government or private entity. It aims to determine whether civil and political, or economic social and cultural rights have been violated by State authorities or their instrumentalities, or by non-state actors including private entities, armed groups or individuals; to assess, monitor and identify gaps in the enjoyment of rights and to map out trends with a view to advise government on necessary reforms, recommend appropriate courses and/or policy measures to improve compliance with State obligations on human rights. Rule 4, Section 6 of the Omnibus Rules of Procedure of CHR provides for an immediate and appropriate action upon receipt of report or complaint, such as preliminary evaluation of the report or complaint to determine whether the matter falls within the CHR mandate. It may employ initial field investigation or fact-finding mission for such purpose. Prescribed time periods have been mapped out for the implementation of the Commission’s obligations of conduct and of result. Rule 4, Section 11 of the Omnibus Rules of Procedure details the processes of CHRP investigation. They are by way of notice, letter-invitation, order, or subpoena. CHRP officials are designated for such a process. However, there are cases, despite the assistance and persistence of follow-up actions by civil society, where CHR Resolutions or Final Reports are not seen. There is a tendency to focus national resources mainly on and prioritize investigations of sensational national cases and forgetting to give equal due diligence and thoroughness to cases of similar proportions in violations and bring local incidences to national attention. (Motu propio investigation) Killing of Dr. Leonard Co, Julio Borromeo, and Sofronio Cortez in an alleged encounter between forces under the 19th Infantry Battalion, Philippine Army and members of the communist New People’s Army (NPA) at Sitio Mahiao, Barangay Lim-ao, Kananga, Province of Leyte on 15 November 2010. Resolved by the Commission en banc on 22 November 2012. (Complaint investigation) Alleged extra-legal killing of former Police Inspector Nathaniel Capitanea by Director General Dionisio Santiago and other operatives of the Philippine Drug Enforcement Agency (PDEA) at Joya Towers Condominium, Makati City on 22 August 2009. Resolved by the Commission en banc on 24 November 2011. (Motu propio investigation) Alleged shoot-out in Paranaque City between Government law enforcement officers and alleged group of armed robbers resulting to the death of sixteen (16) persons including innocent civilians, and the wounding of several others on 5 December 2008. Resolved by the Commission en banc on 6 December 2010. (Complaint investigation) Displacement complaints of residents of Didipio, Kasibu, Nueva Viscaya by the mining operations of Oceana Gold Philippines Incorporated (OGPI), and members of the Philippine National Police-Regional Mobile Group (PNP-RMG) in Kasibuon 2 October 2009. Resolved by the Commission en banc on 10 January 2011. (Motu propio investigation) Arrest, Detention and Torture of Abdulkhan Ajid by Capt. Sherwin Guidagen, SSgt. Elmer Magdaraog and Sgt. George Awing in Basilan on 23 July 2011. Resolved by CHRP Region IX on 18 April 2012. (Complaint investigation) Capion massacre 1Lt. Dante Jimenez, et al (elements of 27th Infantry Battalion, Philippine Army) on 18 October 2012. Resolved by CHRP Region XII on 18 June 2013. The first four cases were directly assumed by the Commission en banc while CHRP Regional Offices handled the last two. They all bear national, regional or international implications as human rights are national and international issues, the “accused” were duty-bearers and situations happened in the exercise of their functions and responsibilities as State agents. There is therefore a blurred definition on what merits a Commissioner’s investigation. In all the cases, prompt responses of the Commission are remarkable. It acts on cases only days after the filing of complaint or after receiving reports. It is however saddening that it takes an average period of two years to finally resolve cases on matters of the Chairperson’s or Commissioner’s investigation. It takes an average of eleven months from the last activity related to the investigation to file resolutions of the cases or write the final report assuming it follows Rule 4, Section 17 of the CHRP Omnibus Rules of Procedures. Certainly, CHRP investigations are supposed to stick to the human rights questions of the case using available laws of the land, applicable jurisprudence and in accordance with international norms and standards. It does not venture whether the precipitating conditions of violations are legitimate or officially sanctioned. It looks at details of a case from the optic of rights, the arbitrariness of the commission of violation and the omission of responsibilities of State agents based on substantial evidence. Its resolutions are in forms of recommendations for action regarding the case “be it an endorsement for the filing of appropriate criminal, administrative or civil actions before the competent fora; or endorsement for appropriate legislative, judicial, administrative and policy measures; or for the grant of financial assistance, whenever applicable.” It is however, unclear how the Commission monitors the impact of the recommendations as most of accused are still in active service and justice is still elusive for many victims of human rights violation. With the long period for the Commission’s case resolution to come out, most witnesses become uninterested or afraid to testify. There are some cases, however, wherein CHR’s monitoring warranted a necessary intervention to ensure the State’s compliance of due process to avoid a domino effect of violations, especially those of media low-profile incidences. There is a concomitant danger as well that pronouncement of human rights violations are held back until the whole legal investigation is finished even though some of the violations should be stopped as in the case of Norman Mariano in Dona Remedios Trinidad, in the province of Bulacan. The Commission has a total of 539 filled-up positions in 2012. Two hundred forty-seven (247) personnel are assigned in the central office and 292 personnel in regional offices. Of this number, 278 were male while 261 were female. It has 113 lawyers, 158 investigators and 54 trainers/education officers. Pursuant to the FY2012 General Appropriations Act, the Commission was provided with a budget appropriation of US$8,307,130 for its programs and projects plus an allotment balance carried over from FY2011 in the amount of US$175,355; thus the Commission worked with a total budget of US$8,475,310. The mandate of CHRP is composed of a range of responsibilities detailed in its operations. It demands competence, responsible and reliable staff or employees, and enough budget. It requires accountability. The CHRP was tasked to head and convene the Oversight Committee of the Anti-Torture Law 2009 (RA 9745). Despite repeated request of CSOs to CHRP to convene the body given the numerous problems encountered in cases filed in courts, the Committee has not been convened. Learning from this, the Philippine Congress, did not include similar provision under the Anti-Enforced or Involuntary Disappearances Act (R.A. 10353). The CHRP is often times the last recourse of victims to exact justice. Thus, incompetence has no place in the institution as inefficiency of personnel backfires primarily on the victims. Such was the case wherein the affidavit prepared by CHR Region was used by the prosecutor against the victim. In the Lenin Salas torture case, the investigation was also flawed which caused the dismissal of the case. CSOs are tempted to believe that the Commission is disoriented in terms of its functions. They question how the Commission’s Manual of Procedures is being observed and the concept of sensitivity practiced in dealing with the victims and support groups. In the case of three missing Muslims in January, CHR admonished the families of the victims for not approaching the right office. There is no clear policy on joint investigation with CSOs, as the Commission does not always want to endorse the (joint) final report. There are existing desks on children and women; CHR is even designated as the Gender and Development Ombudsman but no clear procedures, guidelines, programs and plans on these areas, which cause frustration to advocates of these sectors. It does not lead in educating the public of the impact of lowering the age of criminality of children in conflict with the law. There is no system of case-feedback within the Commission, from the national office to the region and vice versa. Even if there is, it is not working and burdened by the infighting among the commissioners and loyalties of the directors and staff. The issue of professionalism has affected the efficiency of the Commission and it exacts its toll in the manner of its slow responses to cases and unsatisfactory assistance. The Commission fails to provide and publish opinions, recommendations, proposals and reports on major human rights issues in the country. It does not comment on the human rights perspective of existing bills and legislations that impact on human rights. If it does they are not published and popularized. Despite the fact that the CHR acknowledges their lack of personnel and resources to be able to respond quickly to reports of arrests without warrants or abductions or extrajudicial killings, especially in the interior of rural areas, it does not resolve yet the issue of deputation or accreditation of others, as a group of CSOs has recommended to the CHR a long time ago. Human resource is the blood of the Commission and the life of any organization. Investing on it is a lifetime guarantee that CHRP (personnel, staff and even the commissioners) possess needed human rights orientation; skills in promotion and protection are multiplied and continuously enhanced. It is observed that only the top-level management avails of the education and training opportunities. And, sometimes it is more of a ‘junket’ than need. The effectiveness of the current Commission can be gleaned from the performance of its mandate. The lack of public information of its annual assessment and reports of its overall functioning makes it more difficult to determine as to what the Commission really achieved. It has no impact as to its role of monitoring the government, as it has no critique on its performance vis-a-vis its obligations as a State Party to many international human rights instruments. On HRE, CHR performance is disappointing. It gives doubt as to the impact of its education program for the security sector with its continuing dismal records on the promotion and protection of human rights. It fails to monitor how AFP-Human Rights manual is implemented on the ground given that it endorses it. CHRP provides spaces for CSO/NGO to participate in its activities when it sees inputs from CSOs are valuable. Despite the many activities done jointly with the CHR, these were on a per activity and per program basis. There has been no joint planning on a strategic level even as it was stated in its 2010 Roadmap. 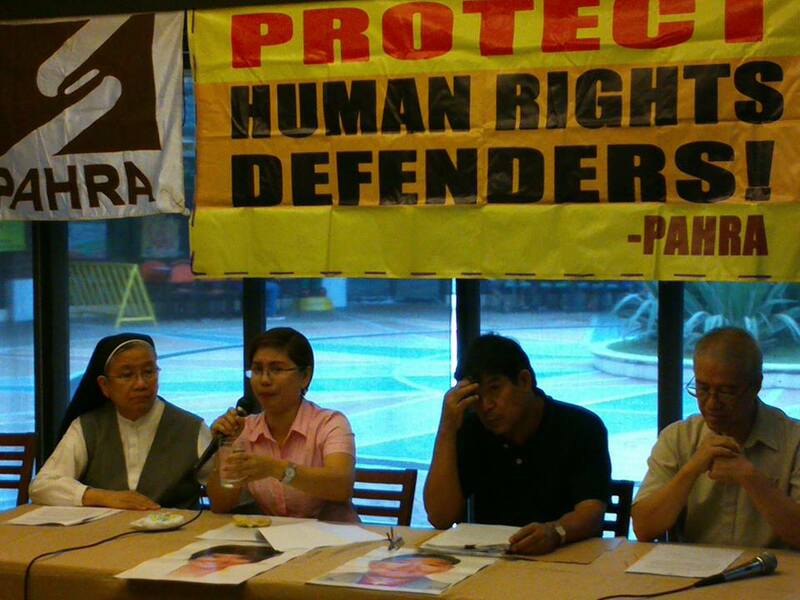 The relationship between CSOs and CHR has not yet been institutionalized. What has been set up by the CHRP as an office and with an officer-in-charge was non-functional for two years. It is observed, however that a practice of putting exorbitant registration fees especially on conferences makes it difficult for the latter to participate. A case in point was the holding of Education Conference in Tagaytay (first scheduled at PICC); fees were first set at US$71 (Php3,000) then later raised to US$118 (Php5,000) even as feedback in this regard was sent earlier to the Commission’s program in-charge. No one from among the 24 organizations who assessed the performance of CHRP in November 2012 attended the conference. CSOs particularly human rights NGOs work on specific programmed and tight budgets. They are willing to input human resources and contribute ideas, but may never juggle funds for external activities outside of its approved project funding. Sponsors and financiers for activities are a big consideration as to determine participation of NGOs. NGOs acknowledge the contribution of the Commission in the anti-mining campaigns by coming up with the Didipio Resolution (2011), assistance during the Alternative Minerals Management Bill (AMMB) Caravan, and designation of focal person for indigenous peoples (IPs). However, CSOs wonder how the Resolution was used, popularized and maximized as the questioned Oceana Gold Philippines (OGPI) company proceeded with its operations. It was a surprise then that, CHR Region 2 commended OGPI for “incorporating and observing a human rights perspective in the conduct of its business affairs and for giving due consideration to cultural rights within its mining operations in Nueva Vizcaya and Quirino”. The CHR National Office was not aware of this commendation. Related government offices on mining and IPs’ concerns have minimal knowledge, if none at all on the said resolution. CHR regional offices’ response to complaints from Salcedo, Tampakan, and Bayog, Zamboanga was lukewarm. The focal person on IPs has no linkage or coordination with the National Commission on Indigenous Peoples (NCIP). There is a wide disparity in documented cases between the CHRP and human rights NGOs. Yet, there is no attempt on the part of the Commission to investigate and validate on its own these cases and reports. It relies more on receiving complaints before acting or investigating. Even with complaints, local offices vacillate on its response. Many cases (particularly EJK) in Mindanao are not included in its data. Particularly, the killings in Compostela valley patterned after the style of the Davao Death Squad (DDS), which the CHR regional office refuses to recognize. The Commission is full of bureaucratic requirements. It is hard to invite CHRP doctors to visit detention centers, even if cases are already publicized. NGOs still are required to furnish formal request letter to compel CHRP to use its visitation power. CHRP medical teams are usually ill prepared in conducting visits to jails. They lack equipment or intentionally forgetting to bring their kits for handling and assessing patients. Their services are not satisfactory. Feedbacks on this regard are sent from time to time to the Commission but nothing so far has changed. This section bears the responses of the CHRP on the questionnaire sent by ANNI on “NHRIs: Role as Defender of Human Rights Defenders (HRDs)” and on “Business and Human Rights”. In fairness to the Commission, there are efforts made to include general concerns of HRDs in government engagements and in international fora. For one, it involves HRDs in consultations regarding policy proposals and reporting processes of the Human Rights Council (HRC) and UN Treaty Bodies. In some cases, it has intervened in disputes between HRDs and authorities. Lately, the Commission joined hands with Human Rights Defenders – Pilipinas (HRDP) to initiate efforts in enhancing security/protection skills of HRDs (for both external HRDs and CHRP staff). Entitled, ‘Enhancing Security by Human Rights Defenders’ this maiden joint project aimed to provide introductory training and capacity-building formation for Human Rights Defenders (HRDs) particularly on security and precautionary measures. Then again, the above-mentioned engagements were all on activity-level, there needs to be a programmatic approach within the Commission in handling issues and concerns of HRDs. Business particularly extractive industry (mining) in the Philippines has taken center-stage in the Philippine development plan. On 6 July 2012, the President released Executive Order No. 79 otherwise known as “Institutionalizing and Implementing Reforms in the Philippine Mining Sector Providing Policies and Guidelines to Ensure Environmental Protection and Responsible Mining and the Utilization of Mineral Resources”. While it declares “no go zones” (areas closed to mining), requirements of Cost-Benefit Analysis, Preliminary Environmental Impact Assessment (PEIA), and Extractive Industries Transparency Initiative (EITI), moratorium on applications and permits, review of mining projects and contracts, recognition of local autonomy and the Free, Prior and Informed Consent (FPIC), and the like, its catch-all phrase in Sec. 1 “…all existing mining contracts, permits and agreements are valid, binding and enforceable…” gives misleading signals. The commission of mining-related violations in 2011 up to the present provides more justification that the EO fails to ensure compliance of companies to sustainable development, human rights, poverty eradication and full human potential. It does not require industries to include Human Rights Impact Assessment (HRIA) in its regulatory reporting regimes. Mining related violations do not only affect individuals; they concern the gamut of economic, social and cultural rights (ESCR).At present, the Commission reviews its existing mandates to include monitoring and investigation of ESCR cases especially those perpetrated by Non-State Actors (NSA). A provision on this sort is included in its proposed Charter. Although the Commission is mandated to investigate and monitor cases of human rights violations and other similar concerns, it is not legally authorized to adjudicate and issue binding decisions, orders and judgments. Thus it is inevitable for the CHRP to refer cases to the domestic jurisdiction. More so, the CHRP does not have the legal mandate to enforce its decisions. Once endorsed, the CHRP will continuously monitor the concerned government agencies’ compliance with the recommendations of the CHRP. This report is an effort to initiate dialogue toward institutionalization of CSO-CHRP Relationship. It wishes to reaffirm the crucial importance of productive engagement and cooperation between NGOs and NHRIs in enhancing roles for promotion and protection of human and peoples’ rights. We believe that both the CSOs/NGOs and the CHRP look forward in finding ways of ensuring independent, efficient, effective and accountable National Human Rights Institution with the vibrant cooperation of civil societies. To approve the Philippine Human Rights Action Plan (PHRAP) and direct all agencies to fully implement it. To establish criteria for candidates and set up mechanism ensuring transparency in the selection process of the Commission which allows active participation of civil society. To make priority the passage of the CHRP Charter, expanding and strengthen the Commission’s role to promote, protect and fulfill the political, civil, economic, social and cultural rights of the Filipino people. To provide needed budget and ensure automatic appropriation for the CHRP to effectively implement its mandates and programs. To establish, among others, mechanisms for accountability of Commissioners and Directors. To come up with common understanding on the issues of HRDs and their application in all its offices through adoption of resolution, programs and activities specifically geared towards protection of HRDs. Popularize and issue timely public pronouncements, guidelines and positions on issues affecting human rights conditions on the ground. Clarify relationships and establish internal mechanisms to present a clear, unified vision and leadership of the Commission. Strengthen the whole Commission (leadership and ranks and files) with the knowledge on human rights and the capacity to promote and protect these with effectiveness and efficiency in implementing programs and mandates. Institutionalize CHRP–CSOs relationship following recommendations of the Kandy Program of Action. Office of the High Commissioner for Human Rights (OHCHR) Statement. 12 July 2012.
b) The Regional Director, or in his/her absence, Chief Investigator of the CHR Regional Office or Sub-Office concerned, for cases taken cognizance of or filed with the CHR Regional Office or Sub-Office concerned. d) Inform the invited resource persons, if any, of the time, date and place of the conference or dialogue; and for said resource persons to submit their comment, opinion or position on the issue on or before the scheduled date of the preliminary conference or dialogue or inquiry within ten (10) days from receipt of such invitation or within such period as the CHR investigating authorities may deem reasonable. Refer among others, to cases of the enforced disappearances of the PICOP 6 in Agusan del Sur (Mindanao) (CHR Case No: CRG-Y2K-42-AS). A case in point would be the massacre of the Miraflores brothers in Zambales. (CHR Case No: CRG-Y2K-42-AS). According to the National Bureau of Investigation (NBI), one or the other brother bore broken lower leg bones and had marks of possible torture. The CHR did not follow these through, either on the regional or national level. Fear, poverty and low-profile were factors that marginalized the incident, and eventually reduced to the status of being mere statistics in the data bases of human rights violations. Norman Mariano was subjected to interrogation without counsel and was coerced to sign blank papers as a conditionality to be treated of his gunshot wound while being detained in a military hospital in July 2011. On a Saturday of November 2012, Children’s Legal Rights and Development Center (CLRDC) requested assistance from the Commission to at least facilitate or order a Quick Response Team (QRT) for children who were victims of abuse but were informed as it was a Saturday, there was no one at the CHRP office to take action. Similar experiences of PAHRA member, MAG when requesting QRT from a Regional Director of CHR for an arrest and torture case in Zamboanga on a Saturday. The Director said he would attend to it first thing on Monday. Maricel T. Fernandez and Alex B. Brillantes, Jr, PhD. The State of Human Rights Education in the Philippines: Issues, Concerns and Directions. December 2012. HRE is implemented for compliance purposes only: generally, human rights concerns are incorporated in various subjects taught in schools. At the elementary and high-school levels, human rights values are integrated superficially in Social Studies (Araling Panlipunan). At the college level, it is incorporated in the National Service Training Program (NSTP), Social Sciences Courses, Constitution, Bill of Rights, among others. Where appropriate and when the opportunity arises, the teachers incorporate HR in the Gender and Development (GAD) and Violence Against Women and Children (VAWC). Partnership with Civil Society Coalitions and Networks during the UPR process; engagement in the Treaty Reporting Mechanisms: CESCR, Committee against Torture, Migrant Workers, CERD, CRC and in the recent ICCPR reporting. Commission in partnership with the AFP, the PNP, Alternative Law Groups (LLG), PAHRA and the Hans Seidel Foundation launched the project “Community-Based Dialogue Sessions on Human Rights Promotion and Protection Between the AFP and the PNP, and CSOs and Local Communities”. The project involves the conduct of a series of dialogue sessions in different areas nationwide. These dialogue sessions provide a venue for civilians and officers of the AFP and the PNP to discuss together and share information the human rights situations on the ground, identify issues and gaps as well as mechanisms for cooperative efforts. On a case level, one recent example is on the detention of Cocoy Tulawie, a human rights defender from Sulu. 27 October 2011: Memo instructing the Department of Environment and Natural Resources (DENR), Climate Change Commission (CCC), Presidential Assistants on Climate Change and Environmental Protection as Mining Study/Policy Group. Mining is included in the industrial priority list (Arangkada 2011), and the Medium Term Philippine Development Plan (MTPDP). Alyansa Tigil Mina (ATM). Philippine Mining Situationer. 2013. CHRP has advocated for the inclusion of the requirement of human rights impact assessment (HRIA) reports in the guidelines for the national observance of human rights in the mining industry during the consultations with government agencies involved in the regulation and monitoring of mining activities. CHRP seeks to operationalize the “Respect” Pillar of the UN Guiding Principles on Business and Human Rights through the institutionalization of the HRIA. CHRP coordinated with international NGOs that conducted a HRIA of the activities of a mining firm in Mindanao, and convened stakeholders for validation at the community level and at the level of concerned national government agencies.